Unruffled by the rigors of the city life, the municipality of Ternate best illustrates how life is in the countryside- calm and simple. Feast your eyes on the picturesque scenery as you travel one hour and a half from Manila to the town dubbed as a paradise for beach lovers. Ternate offers the beauty of nature, pristine beaches and exciting water activities such as boatng, kayaking, cruising and jet skiing. This area is another promising alternate kayaking destination in the country. Just 90 kilometers and 90 minutes south of Manila in Ternate sits Caylabne Bay Resort. When you want a change of scenery but require the complete conference facilities of the office, look no further than Caylabne. Hold meetings by the beach; brainstorm under the stars, go teambuilding with your choice of sport, or you may cruise along by the bay overlooking famous Corregidor Island while organizing presentations. Also get close to nature as you go hiking up the trails and experience bird watching while discussing sales projections. In Caylabne, business can be such a pleasure. 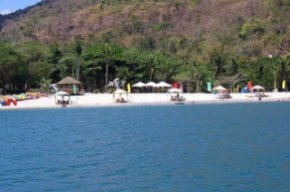 Another place for fun and relaxation is the Puerto Azul - Paniman Beach Resort. It brings together the best elements of nature, privacy, comfort, service and fun for a totally refined beach resort experience that you can get pleasure from. For a more secluded getaway, the Marine Beach Beckons for some pleasurable swimming, or just wading by the shore. This place is maintained by the Philippine Marines but open for those who wish to enjoy the quiet, crystal clear waters of Ternate. And for the people who want to know the historical past of this immeasurable town, check out the splendid past of the Sto. Niño Parish of Ternate. It was built in 1692 in honor of the miraculous Sto. Niño and for the Christianized Mardicas (first settlers of the town) who fought for Spain.